In a secret lab a mad scientist tests his newest discovery. Has the scientist gone too far? Play the Madder Scientist Slot, and you’ll find out. This game contains 30 paylines, a Respin Feature, Bonus Round, Wild Feature, and more. 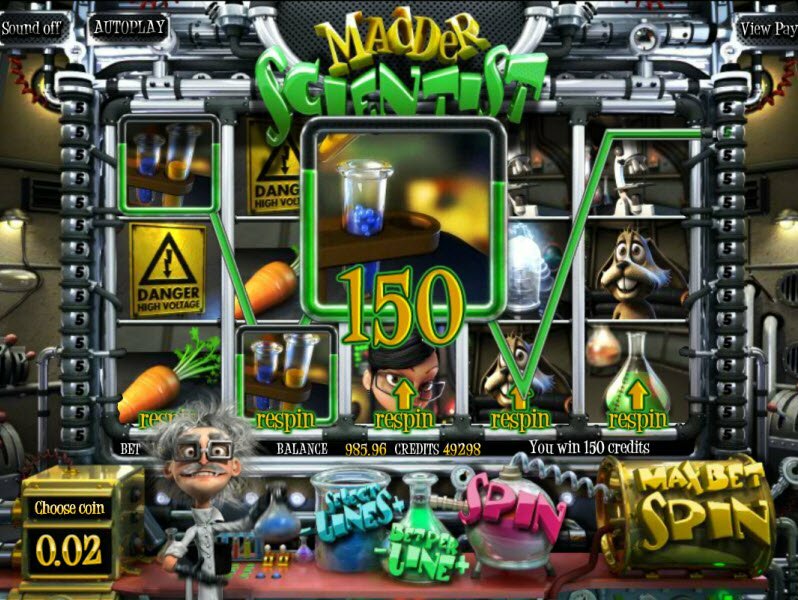 Betsoft’s latest creation, The Madder Scientist Slot, involves the eccentric Dr. Walter Prescott and his wild lab experiments. Watch as the outlandish scientist works in his lab while you spin the reels for money. The animations and features keep this game exciting. Lucky players who land on 3 or more carrots enter the Bonus Game where they have the chance to win bigger payouts. Before even starting the game, you can sit back and enjoy the exciting opening movie. That crazy old scientist turns a carrot into… karats! Okay, so the concept might be a little silly, but what it lacks in sensibility, it more than makes up for with its high-quality 3D graphics. It almost seems like you can reach out and touch the mad scientist’s hair! The music playing in the background feeds into the mischief and madness of the game. Spin the reels and you’ll find all kinds of lab equipment such as beakers, microscopes, test tubes, and even lab rats, or well, in this case lab rabbits. Watch as Dr. Prescott works below the reels. What will the crazy scientist come up with next? There’s only one way to find out! 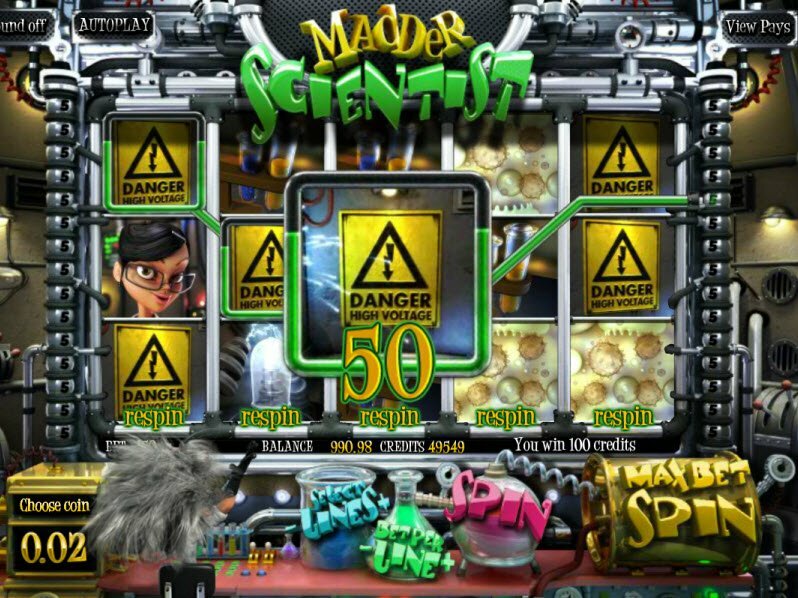 The Madder Scientist Slot has a magnitude of Bonus Features, but my favorite has to be the Reel Respin Feature. This feature allows you to respin any of the five reels after each spin. 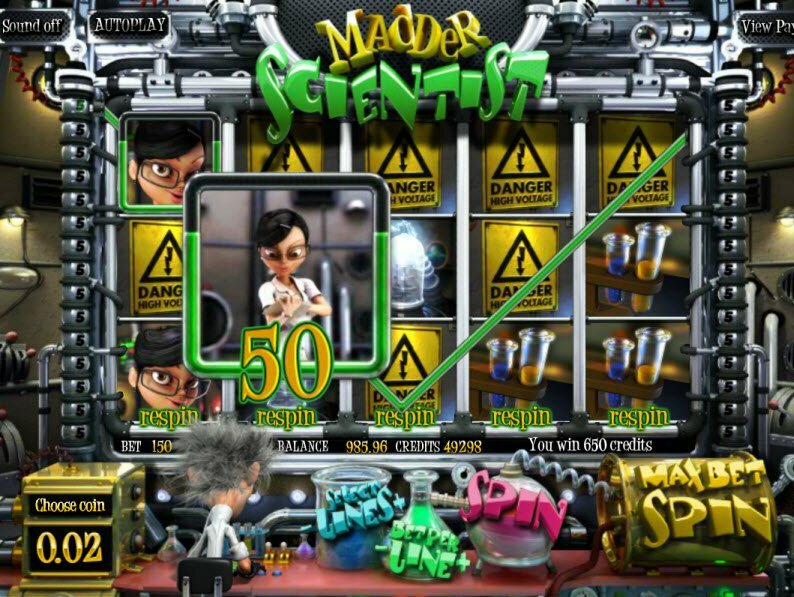 The Madder Scientist Slot has a magnitude of Bonus Features, but my favorite has to be the Reel Respin Feature. This feature allows you to respin any of the five reels after each spin. Although the respins cost additional credits, this feature gives you a much better chance of winning. The Madders Scientist bonuses don't end there. When 3 or more Carrot Symbols land on the reels, you enter the Bonus Round. During the Bonus Round, you help the crazy old scientist mix up his latest concoction. Then test the carrot to see the results! When 3 Beaker Symbols appear on reels 1, 3, and 5, they trigger the Click Me Feature. During this Bonus Feature, you choose a beaker to reveal a prize. You continue to choose prize after prize until the world “Collect” appears. If 3 Switch Symbols appear on the screen, you enter the Wild Switches Feature. One of the five reels will turn Wild for a certain amount of spins.